It was a crisp fall day in the Upper Susquehanna watershed, but Choose Clean Water Coalition members were just getting warmed up. The State University of New York (SUNY) at Oneonta, hosted the Third Annual Upper Susquehanna Watershed Forum, “Connecting New York to the Chesapeake”, with nearly 100 advocates, clean water practitioners and agricultural experts coming together to share success stories and to build partnerships. Some of us, who arrived a day early, braved the cold, rainy weather and learned more about the problems and successes facing Otsego Lake – the initial source of the Susquehanna River and Chesapeake Bay. The members met at SUNY Oneonta’s research and education facility on the shores of Otsego Lake, just outside of Cooperstown, New York, and were afforded a short, but magnificent ride on their research vessel once the rain and sleet had eased up. The following day, we rolled up our sleeves and prepared ourselves for an outstanding conference. It was time to get down to business. Choose Clean Water was welcomed by the Dean of SUNY Oneonta, and also by Congressman John Faso (R-NY). We expressed Choose Clean Water Coalition’s purpose, efforts and victories. Claire Flynn outlined the opportunities for funding provided by the National Fish and Wildlife Foundation and their Chesapeake Stewardship Grants. Wendy Walsh announced all of the great work the Upper Susquehanna Coalition does throughout the upper watershed, and what they can provide to assist others in their endeavors. Government presence was there throughout, with several local government representatives (elected and appointed) who participated in the symposium. Speakers from NY Department of Environmental Conservation spoke on their achievements in the upper watershed. Mary Gattis, Director of Local Government Programs and Coordinator of the Local Government Advisory of Alliance for the Chesapeake Bay, galvanized local government officials to collaborate and work together towards common goals. What was the juiciest talking-point-of-the-day do you ask? Well, that would be agriculture. The biggest topic of conversation for the forum was agriculture – and a lot of it. Jordan Clements with Otsego County Soil and Water, assembled an excellent panel with enlightening dialogue on the region’s dairy farms featuring Dairy Farms and Farmers as Stewards for Water Protection. Jordan also put together a field trip, which took place towards the end of the day to a local dairy farm, ran by a young couple who are wonderful stewards of their land and water. We had a couple of excellent presentations highlighting local Coalition members and watersheds – from the Butternut Valley Alliance and the Friends of the Chemung River Watershed. Some of us then learned what Pecha Kuchas are – a timed lightening round of powerpoint presentations where the slides are timed to ensure that the speaker speeds things along. It was not, as at least one of us thought, a less visited ancient site in the Peruvian Andes. These presentations were very well done, quick, and highlighted local projects. We also learned a lot about conservation easements from David Diaz, with the Otsego Land Trust. A few of us also went for a scenic hike on what SUNY Oneonta calls their College Camp – a beautiful 276 acre wooded parcel of land at the top of a large hill (or small mountain) connected to the main campus. Partnerships were made and continued – some at the post-conference Happy Hour at a local brewery, which included local dairy products compliments of the American Dairy Association North East. I would be remiss if I didn’t also mention the work of the Coalition’s new State Outreach Lead for New York, Angela Hotaling with NY League of Conservation Voters, who coordinated all of the planning for this great event. Also a special thanks to Les Hasbargen, a professor at SUNY Oneonta who made the venue available to us. And before the day was over, there was a lot of discussion about what to do next year. None of the voices were about whether or not there would be a Fourth Annual Forum, but only about where and when it should be. One thing I know is that I’ll be there. To simply put it – it was a great day. Peter Marx is the federal affairs contractor for the Choose Clean Water Coalition. Wendy Walsh of the Upper Susquehanna Watershed Coalition speaks at the Upper Susquehanna Watershed Forum in Oneonta, New York, on November 3, 2016. The event was organized by the Alliance for the Chesapeake Bay and its partners to share local knowledge regarding restoration in the Susquehanna headwaters. The Upper Susquehanna River forms the headwaters of the Chesapeake Bay watershed, and is unique in that 99 percent of its headwaters are protected and managed by a network of soil and water conservation districts (SWCDs) working together as the Upper Susquehanna Coalition (USC). USC’s structure allows SWCDs, which are established by state law and work to develop locally-driven solutions for natural resource concerns, to enter into multi-district agreements with a memorandum of understanding. These SWCDs work within their own locality, but also use these agreements to share equipment and training with one another. Together, these districts voluntarily work to improve water quality and quality of life for the 7,500 square miles under their care. The area is overwhelmingly forested—close to 70 percent—which led farms to be built along the banks of streams, directly in the floodplains. “[Sediment pollution] is not running off the farms. It’s the farmland itself” that is eroding away, explained Lovegreen. Following Lovegreen’s State of the Watershed was a local government panel and examples of successful best management practices, or BMPs, with much of the conversation focused on stream restoration. Attendees of the Upper Susquehanna Watershed Forum, including representatives of local watershed groups, tour Silver Spoon Dairy Farm and their BMP initiatives in Garrattsville, New York, following the conclusion of the forum sessions. Communities take a local approach in the Upper Susquehanna, coming together to address streams in every way possible: at the source, across the landscape, in the stream corridor and with programs. Efforts are guided by the USC’s three focus areas: stream corridor rehabilitation, environmentally and economically sustainable agriculture and wetland restoration. “[The strategy] is a comprehensive public participation approach,” explained Tioga County SWCD’s Wendy Walsh. “Farms and communities have trust in the SWCDs, and that’s how we get things done.” Some restoration work might be triggered by forces of nature, but the effort to address it is personal and actionable. Discussion of successful BMP efforts allowed opportunities for attendees to problem solve comparable programs in their own areas of the watershed; themed table discussions during the lunch hour provided networking and platforms for creative solutions. 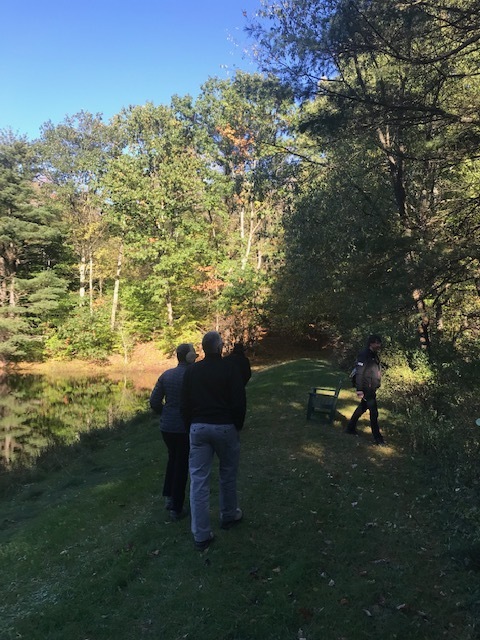 Participants left that day to return to their home organizations with individual commitments toward continued restoration and protection activities, and with a desire for more engagement in the future with their colleagues across the Chesapeake Bay watershed. With continued conferences that provide connections for the work being done all across the watershed and the actions that result from them, the vision of the Upper Susquehanna Coalition may be realized: a well-functioning Susquehanna River headwaters in harmony with itself and the entire Chesapeake Bay watershed. Caitlyn Johnstone is the Outreach Coordinator at the Chesapeake Bay Program.